In this tapestry "Starry Night - Van Gogh" we see the famous painting by Van Gogh. The sense of movement and exhilaration is unmistakable as we witness the mind of van Gogh at work here. to transform a night scene into an experience for the senses. He portrays the stars and clouds in the night sky as an impressionistic scene, merging into the mountains and the town in the valley below. A tall cyprus tree is seen also created in an impressionistic way. This view represents this Dutch artists view from Saint Remy de Provence and is now part of a collection in the Museum of Modern Art in New York. The swirling sky in this work is often considered one of his most well know works. Here we see this scene in all its glory and the colors are evocative to the senses. 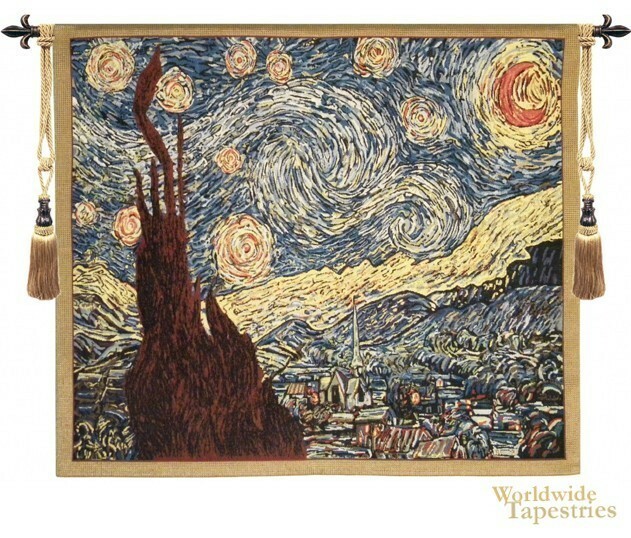 This fine art tapestry "Starry Night - Van Gogh" is backed with a lining and has a tunnel for easy hanging. Note: tapestry rod and tassels, where pictured, are purchased separately. Dimensions: W 21" x H 18"
Dimensions: W 33" x H 26"
Dimensions: W 40" x H 33"